If culture, music, art, and food is your thing, attending Durga Puja in Kolkata should be on the top of your bucket list. Although a widely celebrated all across India, Durga Puja is a festival that finds its true spirit vested in the cultural hub of the country, West Bengal. 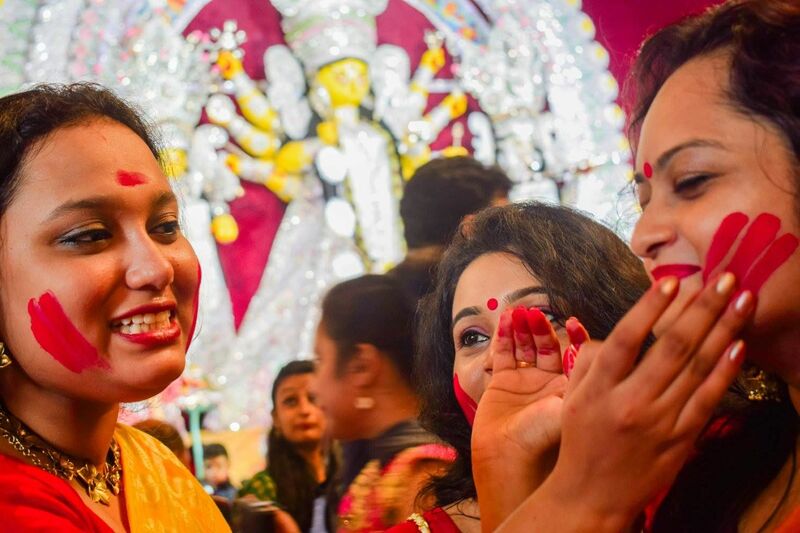 The glorious idols of Goddess Durga, huge pandals filled with fervent devotees, grand Pujos, exciting cultural events and scrumptious authentic Bengali cuisine are a few good things of life that you can only enjoy in Kolkata during this time of the year. That said, it may not be an easy affair to tear your way through thick crowds and may take a lot of grit, guts and time too, but the feat would be worth every time. Moulding the idol of Goddess Durga with the clay collected from a prostitute’s backyard. A highly surprising and admirable notion indicating respect for every woman whomsoever. Shocked? Well, it’s true. 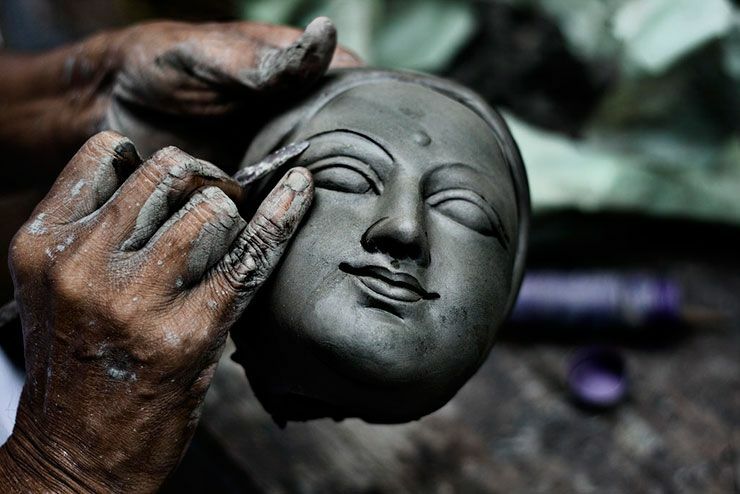 As an age-old tradition, the sculptors take to the deplorable lanes of the redlight areas of West Bengal to get a handful of this revered clay from a prostitute’s yard. It is then mixed with the rest of the soil used to form the idols. It is extremely difficult to craft an idol of the Goddess ideally projecting her valour, beauty and glory, but it is impossible to craft it without a handful of clay from the yards of these often despised women. What can be a better example of truly worshipping a woman, a Goddess, and not the profession, life, or situations that may define her? Just by the thought of Durga Puja, the image of dhaak conjures up in your mind. No Pujo can be complete without a devotee’s perpetual beating of the iconic drum and the streaming of a spirited music that identifies with the very fiesta. All through the festival whether it is the worship of Shakti, the early morning or evening of aartis, dhununchi naach or more, dhaak plays an important role from the beginning until the end of the festival. Dhaak is a traditional practice that undeniably defines the aura, impacts the mood and fills the ambience with exuberance. The traditional dance accompanying the welcome of Goddess Durga during the festival, Dunuchi Naach unfolds a spectacular scenario before your eyes. 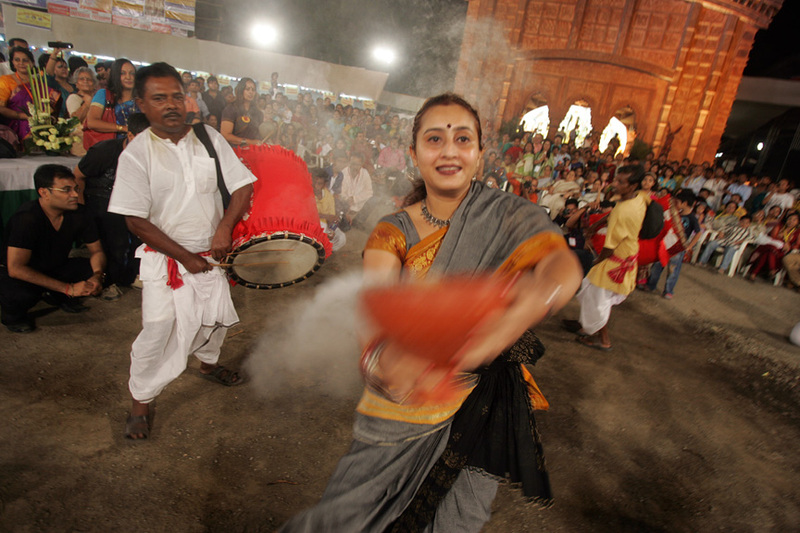 People dressed in traditional Bengali attire of Dhakai or taant saris and embroidered dhoti-kurta, dance to the tunes of Dhaak holding in both the hands Dhunachi, which is an earthen pot consisting of burning coal and incense. The rhythmic dance flowing with the foot-tapping music from the drums receives lots of hails and cheers from the crowd and forms a wonderful sight that can only be experienced in Kolkata. The best part is, anyone, can be a part of this extraordinary affair dancing to the energetic beats of the drum. Typical of any auspicious Bengali event, be it a wedding or a festival, Ulu Dhwani can be heard echoing through the walls. During Durga Puja, all the devotees gather around and unanimously make this distinct sound with their tongue. The widely resonating sound of Ulu Dhwani made with the unison of voice of hundreds of people, is believed to have the power to wade off evil spirits. Pushpanjali is a compulsory part of the celebration of Durga Puja wherein the devotees offer flowers to the Goddess, showering them on Her holy feet. All days of the festival begin with the ritualistic Pushpanjali when the Bengalis wear new clothes, chant holy mantras and offer flowers. The Pushpanjali event taking place on Ashtami holds especially a greater significance. Everyone observes fasting until the ritual is complete after which all are given prasad to eat. 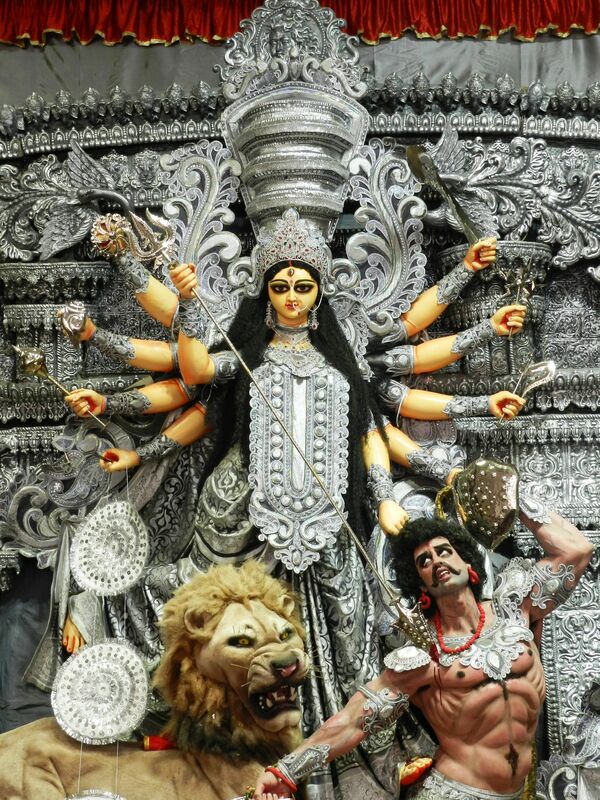 The last day of Durga Puja is marked by the return of Goddess Durga to her husband’s home. Before she departs vermillion or sindoor is applied to the idol, after which the ceremony of Sindoor Khela begins. Denoting a vibrant and playful ritual for the married Bengali women, the occasion is similar to Holi. With red sindoor spread around, the whole affair is one to behold. Women dress up in traditional saris and smear sindoor on each others’ faces symbolizing wishing for a long and happy married life and good luck for one another. The jubilant festival of Durga Puja wraps up with the grand ceremony of immersing the magnificent idols of Goddess Durga along with those of her family member including Goddess Lakshmi and Saraswati, Lord Ganesha and Kartikeya. It is the concluding ceremony which marks bidding adieu to Shakti and wishing for her return soon the next year. 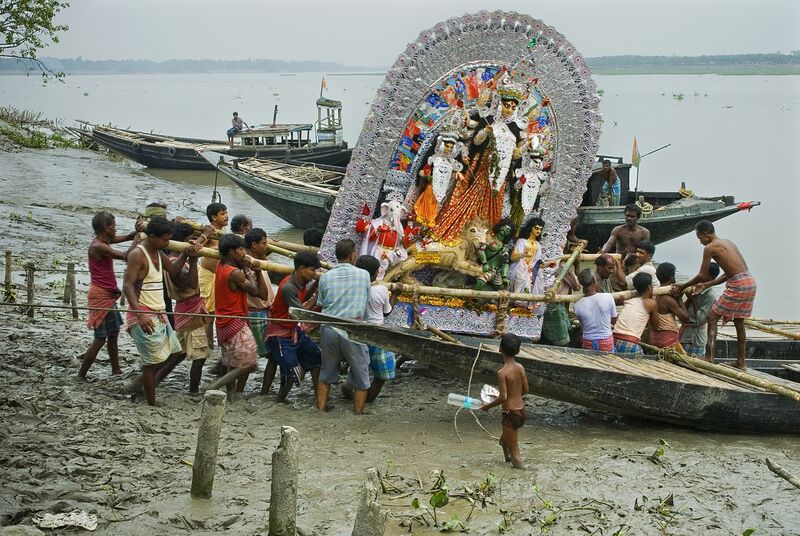 Teary-eyed but with as much fervour as on her welcome, the traditionally dressed Bengalis take these idols to the river banks. The huge processions of people can be seen dancing to the beats of Dhaak with the hope and devotion in their hearts. Durga Puja is one of the biggest festivals of the country which is just another of the golden threads of India’s culture and heritage that are woven together to form its beautiful identity. Anyone hoping to catch a glimpse of the rich cultural roots of the nation should definitely visit Kolkata during the festival of Durga Puja. The amazing and delightful traditions forming this lovely festival are just another compelling reason for you to witness its inherent beauty.